It is not intended for domains to stand alone, rather, they affect one another. Concepts related to country of origin, current residence, the effects of the topography of the country of origin and current residence, economics, politics, reasons for emigration, educational status, and occupations. Concepts related to the dominant language and dialects; contextual use of the language; paralanguage variations such as voice volume, tone, and intonations; and the willingness to share thoughts and feelings. Nonverbal communications such as the use of eye contact, facial expressions, touch, body language, spatial distancing practices, and acceptable greetings; temporality in terms of past, present, or future worldview orientation; clock versus social time; and the use of names are important concepts. Concepts related to the head of the household and gender roles; family roles, priorities, and developmental tasks of children and adolescents; child-rearing practices; and roles of the ages and extended family members. Social status and views toward alternative lifestyles such as single parenting, sexual orientation, child-less marriages, and divorce are also included in the domain. 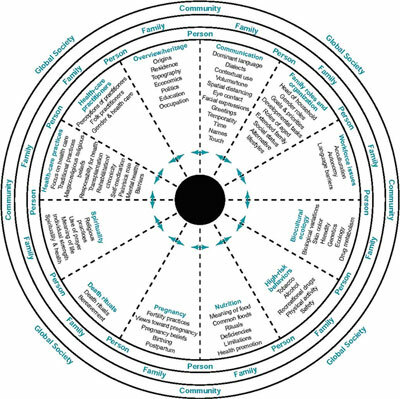 Concepts related to autonomy, acculturation, assimilation, gender roles, ethnic communication styles, individualism, and health care practices from the country of origin. Includes variations in ethnic and racial origins such as skin coloration and physical differences in body stature; genetic, heredity, endemic, and topographical diseases; and differences in how the body metabolizes drugs. Includes the use of tobacco, alcohol and recreational drugs; lack of physical activity; nonuse of safety measures such as seatbelts and helmets; and high-risk sexual practices. Includes having adequate food; the meaning of food; food choices, rituals, and taboos; and how food and food substances are used during illness and for health promotion and wellness. Includes fertility practices; methods for birth control; views towards pregnancy; and prescriptive, restrictive, and taboo practices related to pregnancy, birthing, and postpartum treatment. Includes how the individual and the culture view death, rituals and behaviors to prepare for death, and burial practices. Bereavement behaviors are also included in this domain. Includes religious practices and the use of prayer, behaviors that give meaning to life, and individual sources of strength. Includes the focus of health care such as acute or preventive; traditional, magicoreligious, and biomedical beliefs; individual responsibility for health; self-medication practices; and views towards mental illness, chronicity, and organ donation and transplantation. Barriers to health care and one’s response to pain and the sick role are included in this domain. Concepts include the status, use, and perceptions of traditional, magicoreligious, and allopathic biomedical health care providers. In addition, the gender of the health care provider may have significance. Explanation of the Purnell Model figure. The outer rim represents global society. The second rim represents community. The third rim represents family. The inner rim represents person. The interior depicts 12 domains. The center is empty; representing what we do not yet know about culture. The saw-toothed line represents concepts of cultural consciousness. Purnell, L. (2002). The Purnell model for cultural competence. Journal of Transcultural Nursing, 13(3), 193-197. *Updated figure provided and permission to post theory by Dr. Purnell (personal email communication, May 2013).